American ricotta cheese tends to be very wet,” Francesco complains. 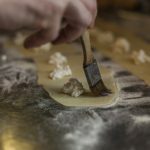 “I like to add some goat cheese to give it more body, but you can do whatever you want.” This is ravioli at its simplest, dressed up for dinner in nutty brown butter and sage, a finishing touch that ennobles even store-bought cheese ravioli. Place the ricotta in a fine sieve and allow the excess fluid to drain for about 1 hour. Mix the drained ricotta with the goat cheese, nutmeg, egg yolks, 2/3 cup (85 g) of the Parmesan cheese, salt and pepper. Set aside. 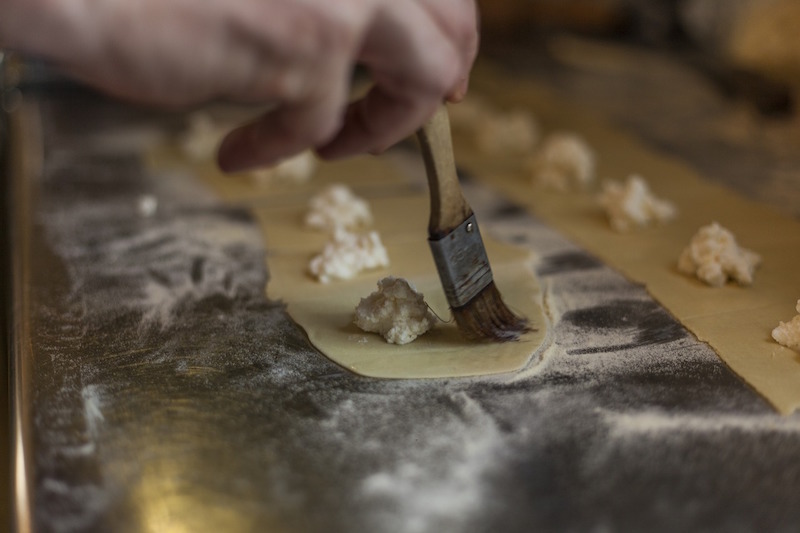 Roll the fresh pasta into sheets and spread half the sheets on a work surface. Brush lightly with the egg-water wash and cut out 2.5-inch (6.5-cm) rounds. Spoon a mound of the cheese mixture onto each round, leaving at least a 1/2-inch (1.3-cm) border. Cut the rest of the pasta into 2.5 inch (6.5 cm) rounds, place the rounds on top of the cheese mounds, then press the edges together by hand or with a fork. Dust lightly with semolina, cover, and refrigerate until just before serving. Heat the butter in a skillet, add the sage leaves, and cook over medium heat until the butter is medium brown. Just before serving, bring a pot of salted water to a boil, lower the heat to a simmer, and carefully slip the ravioli into the pot. Allow them to simmer a few minutes, until they rise to the surface. Drain them well. Briefly reheat the butter and sage mixture. Divide the ravioli among 6 plates and spoon the butter sauce over each. Dust with the remaining Parmesan cheese.